Former Eagles long snapper Jon Dorenbos. Jon Dorenbos didn’t expect the outpouring, but it arrived — in droves. When it became clear that a previously undiagnosed heart condition would end the 37-year-old's football career, head coach Doug Pederson made a promise to the beloved former Eagles long snapper that, should the Birds make it to their first Super Bowl since 2005, he'd be there to watch it in person. "You’re coming with us,” Pederson told Dorenbos. Then, after the Eagles won the NFC Championship, his phone started ringing. Not only did Pederson call, but so did owner Jeff Lurie, GM Howie Roseman, team president Don Smolenski, and then-Eagles offensive coordinator Frank Reich, each one extending a personal invitation to Dorenbos to join them in Minneapolis for Super Bowl LII. Lurie, himself, extended a personal sweetener — a Super Bowl ring, if the Eagles won. The Eagles, of course, came through. These next two days mark the first time Dorenbos, a two-time Pro Bowler and 14-year NFL veteran, will return to Philadelphia to directly interact with his legion of fans when he performs his magic show in an event called, “An Evening with Jon Dorenbos,” at the SugarHouse Casino Thursday and Friday night. Sure, he was part of the Eagles’ victory parade last month, but the always-accessible Dorenbos hasn’t had a chance to truly interact with Eagles fans since he was traded to the New Orleans Saints on August 28, 2017. After playing in 162 consecutive games over 11 seasons for the Eagles, Dorenbos will finally get that opportunity. 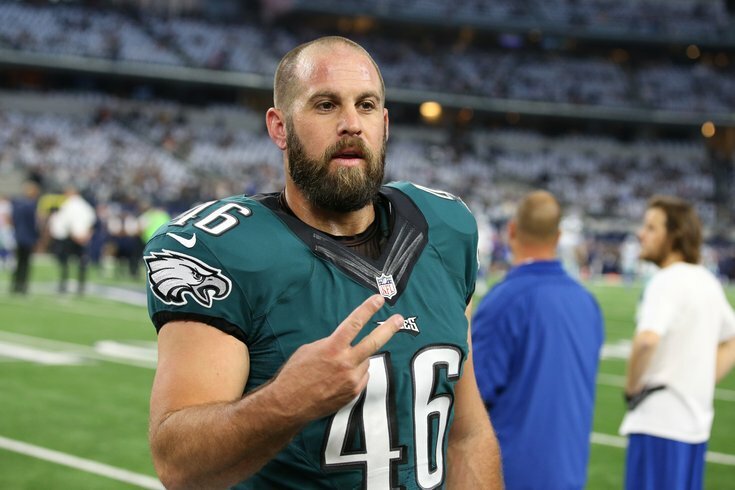 Dorenbos, who before the trade was the longest tenured pro athlete in Philadelphia, underwent open-heart surgery on Sept. 12 by renowned Dr. Joseph E. Bavaria at Penn Medicine to repair an aortic aneurysm discovered during a routine physical. He has an eight-inch-long vertical scar that runs down the middle of his chest. The Super Bowl ring is coming his way after the Eagles beat the New England Patriots, 41-33, in Super Bowl LII. Did he have an inkling he get one of the Birds' baubles? “After the Eagles won the NFC Championship, the Eagles called, and I didn’t want to jinx anything, but Coach Pederson told me in the beginning of the year, ‘If we go (to the Super Bowl), you’re coming with us.’ You don’t really want to bring that up, because you don’t want to jinx it. When the Eagles won the NFC championship, I heard from them within a few days. Dorenbos stressed how great it was to receive the honor the Eagles are bestowing, though he added how it’s just as important to him that three other players are getting championship rings: old battery mate, punter Donnie Jones; recently released tight end Brent Celek; and perennial Pro Bowl tackle Jason Peters, who Dorenbos has known since their days in Buffalo when Peters was a rookie undrafted free agent tight end out of Arkansas. "These next few days will be fun. I will be emotional, I’m sure. I love this city, these fans here and this organization." “To watch those guys, the guys who have been with the Eagles for so long, to see them get rings, to be there and see them experience that whole thing was a huge inspiration and I was really happy to celebrate with them,” Dorenbos said. “It’s not just them, it was also the front-office people, all of the people that have been with Mr. Lurie through the years, the ones behind the scenes that make it work every day, and see the city go nuts, that was great, too. “Think about this, I got to stand on a float next to a Hall of Famer like Brian Dawkins in a Super Bowl parade. Are you kidding me? These next few days will be fun. I will be emotional, I’m sure. I love this city, these fans here and this organization. They all called me, Doug, Jeff, Howie, Don, Frank, and they were like, ‘Hey man, we love you, you’re part of this city and have been part of building this thing for a long time. You still want to come?’ [Bleep] yeah, I want to come! I hung up and got emotional then, too.